Scientists agree that large, destructive wildfires, of which the Fort McMurray fire is a prime example, are becoming more frequent because of climate change. But when it comes to those who warn people about the extreme weather that caused the fires—blistering temperatures, nonexistent snowpack—climate change has largely been scrubbed from the script. Why aren’t meteorologists, the people who tell the public about severe weather, also telling us what’s contributing to it? After all, any respectable climate scientist would tell you that this type of extreme weather is consistent with what you’d expect from climate change. The role of the meteorologist in contemporary society is important but often invisible. They’re the people who remind us to grab a sweater or take an umbrella—sometimes on TV or the radio, more likely through a weather app on our phones. But they are also the only individuals that Americans receive advice from during potentially life-threatening weather. If a meteorologist is warning about an impending storm surge, wouldn’t it be helpful to know that those surges are likely to be worse due to rising sea levels—particularly if you live near the coast? “As a weather junkie as well as a climate scientist, I see it as our responsibility to include context,” Jason Samenow of the Capital Weather Gang told Gizmodo. But meteorologists like Samenow seem to be in the minority. Although 96 percent of American Meteorological Society members say they believe climate change is real and human-caused, climate doesn’t make its way into their reports. On MSNBC, Bill Nye called out the network’s own meteorologists on live TV for failing to make the connection to climate change. Granted, weather is not the same thing as climate. But for the past year, meteorological data has confirmed each month that it is once again the warmest month in the planet’s history, like a broken record of broken records. And after the harrowing weather stories of the last few months—not just the catastrophic fires in Alberta, but also the end-of-days rain in Houston and the most bizarre temperature data ever coming out of Alaska—it’s clear that extreme weather is becoming the norm. Scientists are only now starting to understand how changes in climate affect extreme weather, in a field of study that’s called “attribution.” This has become such an important area that Climate Central has launched an entire initiative around it called World Weather Attribution. By adding historical data and other types of context to extreme weather events, climate scientists look for “fingerprints” of human behavior. Heavy rainfall, like what caused historic flooding in France and Germany last month, has been directly attributed to climate change. But these kinds of weather stories are nuanced and complicated, so it’s not easy to quickly communicate them during the weekend outlook forecast. There are about 2,200 broadcast meteorologists in the US and Climate Central is working with 300 of them, including John Morales, chief meteorologist at NBC 6 in Miami. One might say there is no meteorologist who is more on the front lines of climate change; reporting from a place where “nuisance floods” are now affecting residents more often than not. Morales’ extensive reporting on the link between a warming climate and the city’s intensifying “king tides” earned him a cameo in the famous New Yorker story on Miami’s vanishing coastlines. But if my neighborhood is flooding, does it really matter whether extreme flooding is related to climate change or not? Is believing in the science going to make me pay attention, or prepare, or, as a last resort, evacuate? Social scientists are engaging with that issue through a program called the Communication of Contentious Science, a two-year initiative of the National Academies of Sciences, Engineering, and Medicine that specifically studies skepticism—not just in the field of climate change but other culturally contentious areas like vaccinations. 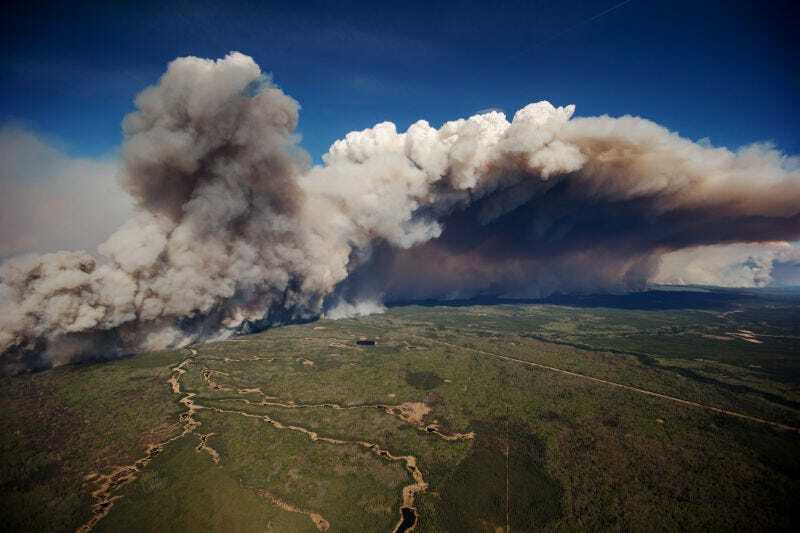 In a place like Alberta, which will be recovering from the Ft. McMurray wildfire for a very long time, it may not be popular to make a connection to climate change, but I’d argue it’s critical. This is a region where the economy is almost entirely supported by the extraction of fossil fuels. These fossil fuels are in turn directly contributing to the warming that has extended the region’s fire season by 20 percent in just 35 years. In this case, suppressing that connection is not just destroying the livelihoods of those residents, it’s criminal. Giving weather attribution data to residents who have lost everything in severe weather events might empower them to demand serious reform.